This second edition of the hugely successful Handbook of Child and Adolescent Clinical Psychology incorporates important advances in the field to provide a reliable and accessible source of practical advice. adjustment to major life transitions. Each chapter dealing with specific clinical problems includes detailed discussion of diagnosis, classification, epidemiology and clinical features, as well as illustrative case examples. This book will be invaluable both as a reference work for experienced practitioners, and an up-to–date, evidence-based practice manual for clinical psychologists in training. 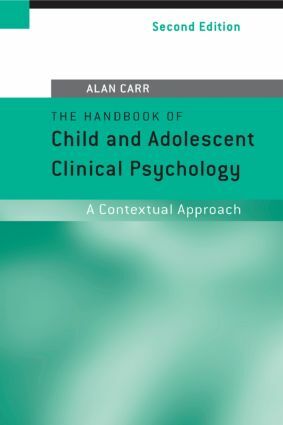 The Handbook of Child and Adolescent Clinical Psychology is one of a set of three handbooks published by Routledge, which includes The Handbook of Adult Clinical Psychology (Edited by Alan Carr & Muireann McNulty) and The Handbook of Intellectual Disability and Clinical Psychology Practice (Edited by Alan Carr, Gary O’Reilly, Patricia Noonan Walsh and John McEvoy).